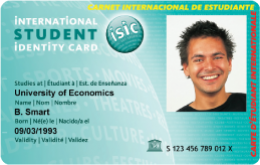 2013 marked the 60th Anniversary of the International Student Identity Card (ISIC). To recognise ISICs 60 years of history a short documentary featuring interviews with key people central to the ISIC cards significant milestones in the past and present. ISIC 60th Anniversary documentary from ISIC Global Office on Vimeo. ISIC continues to be the only internationally recognised proof of student status. However, the growth of discounted airfares online has changed the ISIC card focus. The availability of cheap online flights has led to the decrease in ISIC card sales in the new millennium for simply travel related purposes. Today, the portfolio of benefits and discounts accessible with the ISIC card goes far beyond travel alone. The ISIC card is now also an everyday use student lifestyle card. Cardholders still enjoy discounts and services on travel opportunities. In addition, students gain preferential access to over 150,000 products, services or experiences in every stage and area of student life, both at home and abroad. Want to know more on the history of ISIC? View the latest timeline featured in the 2017 ISIC Association Annual Report.